Involved in the initiation of DNA replication. Also participates in checkpoint controls that ensure DNA replication is completed before mitosis is initiated.Cdc6 has recently been shown to play an important role in the intra-S-phase p21 Waf1/Cip1-dependent DNA damage response. Both cdc6 and CDT1 are degraded by the ubiquitin proteasome pathway in response to DNA damage associated with re-replication. 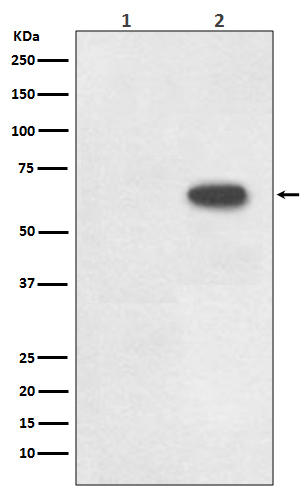 Western blot analysis of Phospho-Cdc6 (S54) expression in (1) Raji cell lysate; (2) Raji + FBS cell lysate.